The Afghanistan Human Rights and Democracy Organization (AHRDO) is an independent not-for-profit organization established in 2009. The working mandate is to promote fundamental human rights values and democratic principles in Afghanistan. AHRDO has adopted unorthodox methodologies to contribute to the internalization and expansion of key human rights and democratic concepts. These methodologies are centered on arts-based, participatory, and bottom-up approaches at the grassroots levels. Over the past several years, AHRDO has established several innovative initiatives, including the Network of Afghan Young Women leaders, the Social Council of War Victims, a compilation of short stories reflecting Afghan experiences of the protracted conflict, and a program to promote human rights culture by encouraging Afghan writers to produce literary works with human rights content and orientation. 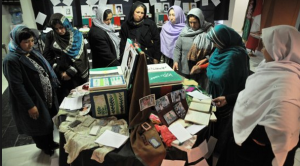 AHRDO has also engaged in promoting policy changes nationally and internationally by writing in-depth research-based policy reports on Afghan women, memorization and transitional justice in Afghanistan.